LevelAc Switches and Control - SL-100 Series | Texas Valves & Instruments, LLC. 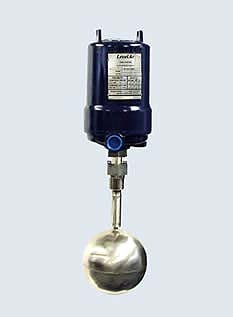 LevelAc's Model SL-100 Series level switches are designed for top mounting in open tanks or closed vessels where top access for float clearance is available. Installation is by means of a 1" NPT connection, Insertion depth should be limited to 132". Mercury Type: Equiped with one or two SPDT mercury switches. Switch Characteristics: Hermetically sealed. SPDT mercury switches are standard. Snap Type: Equipped with one or two SIPDT electrical snap switches or one pneumatic switch. A pneumatic valve with ball seating for tight closing and designed for mounting on a snap switching station. Snap-action of the switch station produces "on/off'" or "closed/vent" operation. May be mounted to vent on high level or low level, Only one pneumatic switch per station may be installed. Rating: 0 to 60 psi max. Mercury Switching Station - A glass capsule containing the mercury and switch contacts is mounted on a pivoted arm. A magnetic armature moves up and down inside a non-magnetic sealing tube following movement of the float caused by changing liquid level in the float chamber. As the armature enters the field of the Alnico V magnet mounted on the opposite end of the pivoted arm, magnetic attraction causes the magnet to approach the sealing tube and tilt the mercury capsule to make or break an electrical circuit. Snap Switching Stations - An Alnico 8 magnet surrounds the sealing tube and concentrates powerful magnetic force in a small space. Movement of the armature into the magnetic field shunts attraction away from the external pole pieces which allows the pivoted actuator plate to "snap" the SPDT switch making the circuit "COM" to "NC" and breaking "COM" to "NO". Interface Operation - To control the dividing line (interface) between two immiscible liquids of different specific gravities, the float is precisely loaded to sink in the lighter liquid above but be supported on the surface of the heavier liquid below. Float loading is based on the minimum specific gravity difference between the two liquids (highest sp. G of the lighter liquid and lowest sp. G. of the heavier liquid) at the operating temperature. For LevelAc's intended for interface service, complete information on specific gravities of both liquids must be furnished. One Station: Adjustable l/2" to 3½", Factory set at 11/2" unless otherwise specified. Two Station: Adjustable - Adjusting nut spacing is factory set for minimum differential. Spacing between stations is set at 3" maximum, This center-to-center spacing is adjustable. Snap Stations: 2" min. to 3" max. Mercury Stations: 1 1/16" min. to 3" max. H - Maximum Insertion Depth. Applicable Dimensions must be specified on order. NOTE: Dimension "H" is the distance from the upper limit of differential "A" to the bottom of the mounting nut. As noted, differential "A" refers to the lower station when two switch stations are installed.